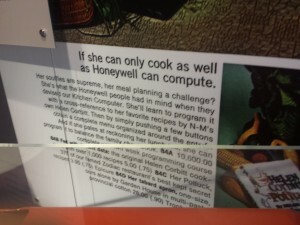 An assortment of things from my first trip to the Computer History Museum in Mountain View (with apologies for the photo quality). 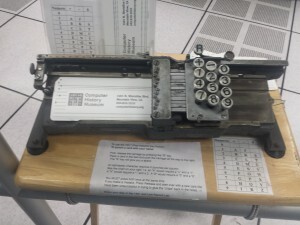 Mechanical Card Punch machine: I love that they had one you could play with! The mechanism is surprisingly smooth and it required little pressure to make perfect-looking holes. 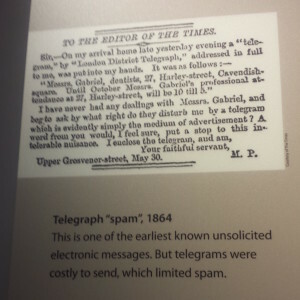 A reference to one of the first ever spam messages – sent by telegraph in 1864! The sentiment about them has not changed much. 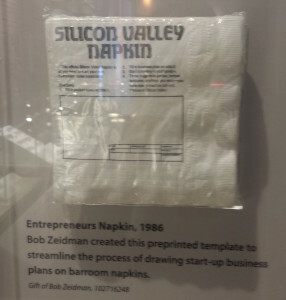 This “Silicon Valley Napkin” for an instant napkin business plan is so much in the spirit of today’s Silicon Valley it surprised me that it was from 1986. Instructions: Fill in product specs on side 1; Fill in business plan on side 2; Start the company in your garage; Throw huge rock parties, temper tantrums, anything you want—you have now joined the rich and famous of Silicon Valley! 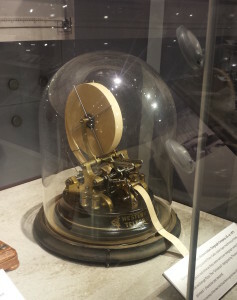 This absolutely gorgeous little stock ticker machine. I want to make one! 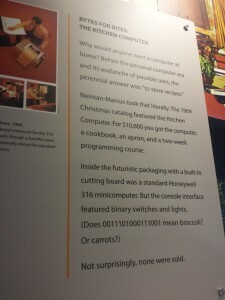 All in all a fun trip! I do wish they had more things you could touch and interact with, though. It would be a really fun project to build replicas and emulators of various machines so you could really understand how they worked. Maybe a good future class project!